On May 18, 2013, Panish Shea & Boyle LLP will proudly sponsor the Angelman Syndrome Foundation at its annual fundraising walk in San Diego by providing breakfast to all participants. The firm also made a financial contribution to the organization. Angelman Syndrome is a neuro-genetic disorder that is characterized by developmental delay, lack of speech, and walking and balance disorders. There will be 28 walks across the country on May 18th and 19th in support of the Angelman Syndrome Foundation. 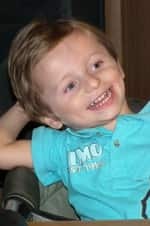 Last December, Panish Shea & Boyle LLP obtained a $10 million verdict for the parents of Kevin Cisler, a three-year-old boy with Angelman Syndrome who died when he slipped down in his wheelchair while on the bus ride home from pre-school and was strangled to death by the straps that were intended to hold him up in his seat. A Crepes Bonaparte food truck will be parked at the event taking place at NTC Park in San Diego to provide breakfast to participants.